Apgar Farms representative Tom Austin demonstrates some of the data available on The Climate Corporation app used at the farm's operation near Tuscola, Ill., on June 10, 2015. Ron Moore is an Illinois corn and soybean grower. As a third-generation farmer, he has seen farm equipment change throughout the decades. 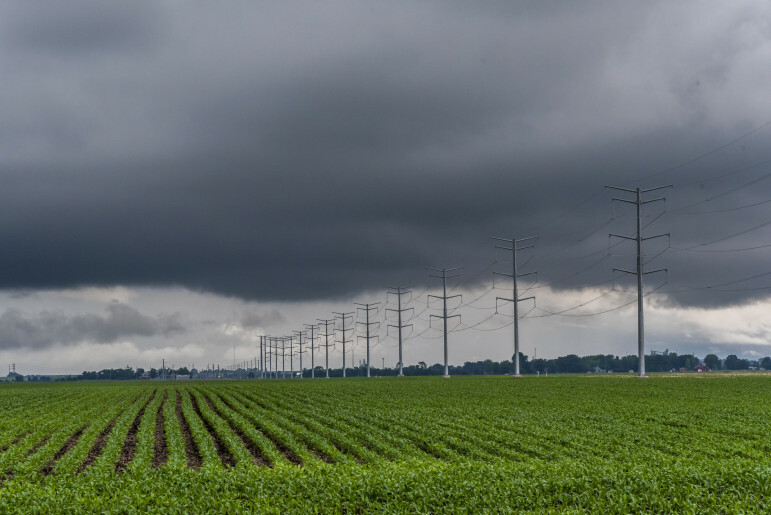 As part of that evolution, farmers have started to use data analysis programs that help better utilize resources and adapt to climate change, which researchers warn will bring more extreme weather and more prevalent pests. “Biotechnology, equipment technology, data collection and data analysis — It’s all of those things working together that allow farmers in the United States to be the best ones in the world,” said Moore, who also serves as secretary of the American Soybean Association board of directors. Improved data analytics have allowed farmers to become more efficient with their seeds, chemicals and other resources, he said. 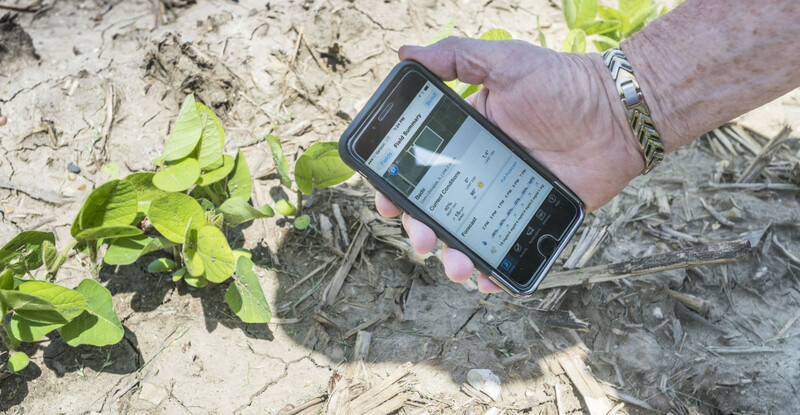 Instead of taking the time to check nutrient levels in the soil, farmers can now access updates at the click of a mouse or the touch of a smartphone screen. Monsanto is widely known as a company that produces genetically engineered seeds, but it has gotten in on farming’s big data business, too. Its purchase of the data company Climate Corporation nearly two years ago is beginning to pay off. “At the Climate Corporation, we believe that data science can help farmers make important decisions about their operation,” said Anthony Osborne, vice president of marketing for Climate Corporation. See related: "The complicated relationship between agriculture and climate change"
The Climate Corporation makes its money by giving meaning to the immense loads of data that farmers are capable of gathering. 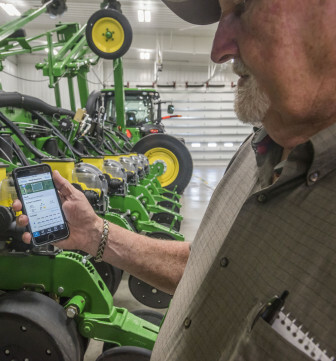 Osborne said an internal Climate Corporation analysis determined that farmers could collect roughly seven gigabytes of data — equivalent to the same digital space as about 200 songs — from every single acre on their farms. Monsanto bought Climate Corporation in November 2013 and now holds all of the company’s outstanding stock. Financial reports show the acquisition totaled about $932 million, and the total cash paid for the acquisition was about $917 million. Apgar Farms representative Tom Austin uses a Climate Corporation app on a mobile phone on June 10, 2015. 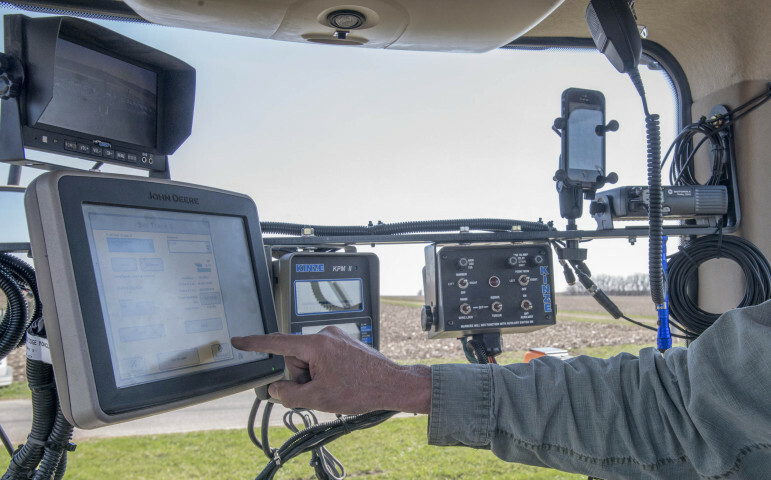 Among its services, the Climate Corporation offers a free product called Climate Basic, which brings real-time weather, soil and crop data together at the field level. For $1,500, farmers can enroll their entire farm into Climate Pro, which adds tools to monitor nitrogen levels for corn acres. A recent company report on sustainability highlighted Climate Corporation’s role in mitigating climate change, as well. “The Climate Corporation platform helps farmers have better harvests through data science, integrating seed science, field science, local weather monitoring, data modeling and precision equipment to develop customized insights field by field,” the report stated. A thunderstorm sweeps over Champaign County in Illinois on May 30, 2015. To ensure its data business’s interests are being met, Monsanto has been active in Washington D.C. in recent months. Federal lobbying disclosure records show the company listed “data services” as one of the issues it lobbied in back-to-back quarters. It spent at least $2 million lobbying in those quarters combined. Monsanto’s Climate Corporation is also one of 19 companies that the U.S. Department of Agriculture works with to provide crop insurance, a series of risk management plans that protect farmers from weather disasters and market fluctuations. Archer Daniels Midland, the American Farm Bureau and John Deere are some of the others. The USDA’s Risk Management Agency oversees the federal crop insurance program. Crop insurance data shows U.S. farmers insured nearly 300 million acres last year. In doing so, growers paid in excess of $10 billion in premiums, though the federal government subsidizes more than half of every dollar farmers pay. In 2014, the government spent about $6.2 billion subsidizing crop insurance. It also pays the 19 approved companies for running their own insurance branches. Farmer Craig Anderson of Mansfield, Ill., prepares his tractor's auto steer, which will navigate the machine during most of spring planting. Moore said increased efficiency means farmers can produce more with the same amount of resources, an important ability with future climate consequences lingering. For example, most farmers apply nitrogen to parts of their field if the nutrient is lacking. Instead of relying on memory, history, field tests or intuition, corn farmers can now evaluate nitrogen information electronically. In many ways, he said, the data analysis in farming is similar to popular data trends in baseball. 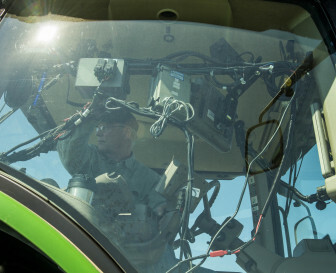 An Illinois farmer looks at electronics in the cab of his tractor on April 19, 2014. Yet, Moore said there are inherent obstacles when it comes to collecting bulk data, as well. “The biggest challenge that I see with collecting all the data is we have the ability to collect a lot more data then we have the ability to analyze,” he said. Additionally, farmers are a historically private group, and many have concerns about how their farm data is being used. Those concerns are compounded by some state “ag-gag” laws that seek to insulate farmers from drone pilots and other outsiders. Osborne said all data farmers give to Climate Corp remains private. “We’re clear in our policy statements and all of our commitments that we make to growers that the data they provide to us is their data,” he said.